Prominent & Leading Manufacturer from New Delhi, we offer dual tv cart im46twtd02. 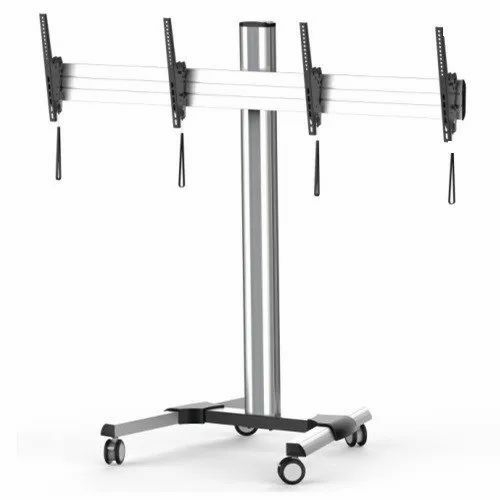 Dual mobile TV cart with stylish, technical and functional design to provide elegant presentation solution for most 40″-55″ LED, LCD flat panel TVs up to 50kg/110lbs each bracket. TV bracket allows effortless height adjustment of max. height of 1720mm for optimal viewing and smooth lateral shift fit different TV sizes ensure perfect display. A full line of optional accessories including camera shelf, DVD/AV shelf, CPU holder, laptop/DVD/AV secure cabinet and power board ensure easy and quick assembly. 4” shock-absorbing wheels support the equipment weight while allowing for swift maneuverability and smooth, quiet positioning. Integrated cable clips keep cables organized. Ideal for conferencing, public displays or other professional presentation. Looking for “DUAL TV CART IM46TWTD02”?